Why their CPU does not show 100% usage? The reason of all those questions is lack of understanding of multithreading and laws governing computing in general. In this article we will try to address some of those misunderstandings and misconceptions. We assume that the reader already read Efficient use of multitreading from AmiBroker’s Users’ guide and is fully aware how work is distributed in many threads in the Analysis window. We also assume that the reader already read Peformance Tunning chapter of AmiBroker’s guide. These two parts of the manual explain fundamental concepts and are essential to understanding of what is written below. Another fundamental reading is Amdahl’s Law article in the Wikipedia that explains theoretical speedup limit of any multi-threaded program. In short Amdahl’s law says that if 95% of your program runs in multiple threads and only 5% of it is serial (single-threaded), the maximum achievable speedup regardless of how many CPUs and how many cores you have is 20x (20 times). AmiBroker is highly parallel multithreading application, so most of steps are done in multiple threads. Specifically only first and last (1. and 5.) step is serial, the rest (2, 3, 4) is parallel. It is worth noting that steps 1-4 are done on every symbol, while step 5 is only done once for all symbols. In addition to that program spends some time handling the UI (things like updating UI controls like progress bar and reacting to your mouse / keyboard input) which is of course done in single (main) UI thread. There is one exception, a special case: Individual optimization. In individual optimization step 1 is done only once (for one symbol), and all other steps 2-5 (so including last one) are done in multiple threads. Now is where Amdahl’s law kicks in. By adding threads/cores/processors you can only decrease parallel parts (2..4 or 2..5) and ultimately you are limited by the speed of data access. You can’t backtest faster than you can read/prepare the data. Only L1 cache runs at full core speed. As you can see L3 cache has half the bandwidth and RAM has 1/4 of bandwidth of L1 cache. Of course disk speeds (even SSD) are far cry behind 11GB/sec offered by RAM. In case of portfolio backtest: a final backtest phase (portfolio backtesting) is one per backtest, done once for all symbols, so naturally it is done in single thread (as opposed to first phase that is done on every symbol in parallel). Now, knowing this all you may wonder how to use all that knowledge in practice. For example it allows to understand the limits of achievable speed gains for given formula and plan your hardware purchases or find ways to improve run times. As we learned from the above the only parts that can be speed-ed up by adding more cores are those that are run in parallel (multiple threads). 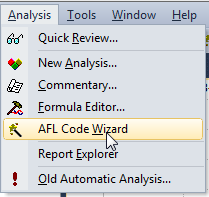 In practice it means – your AFL formula code. What is more the more time is spent in parallel part the better it scales on multiple cores. This means that simple formulas DO NOT scale too well because they are too simple to put enough strain on CPU and are mainly memory (data access) bound. All your simple moving average cross overs are just too simple to keep CPU busy for longer time, especially when there is not too much data to process. and run Optimize->Individual Optimize on symbol that has 2000 quotes. Firstly it may look surprising that “worker threads” time is 3.26 which is way longer than entire optimization took (0.49 seconds). But this time is a SUM of times spent in all 8 threads. They ran in parallel. Each was running for (3.26/8 seconds = 0.4075 seconds), and with only one thread running it would take 3.26s. Now you suddenly realize the power of multi-threading! So now it would seem that our formula run (0.11 + 3.26)/0.49 = 6.8 times faster than on single core. You may ask why not 8x? We had 8 threads, didn’t we? First reason is the Amdahl’s law – serial time (0.11sec) is constant and limits our speed up, no matter how many threads you would put on it, but there is something more. What? Entire optimization took just 1.62 seconds when run in single-thread which is just 3.3 times slower than multi-threaded, not 6.8x as we calculated earlier. Why worker thread is 1.47 ? It was 3.26? What happened? a) Hyper-threading – as soon as you exceed CPU core count and start to rely on hyperthreading (running 2 threads on single core) you find out that hyperthreading does not deliver 2x performance. If your code is NOT doing complicated things like lots of trigonometric functions that put FPU busy or other number crunching, the hyperthreading will not give you 2x performance. On simple tasks it struggles to deliver +30%. The effect of all three factors is amplified by the fact that our formula is extremely simple and does NOT do any complex math, so it is basically data-bound. This is why single-core execution was not as bad as we expected. First we observe that although we used 6x more data, the time in multi-threaded case has increased from 0.49 to 1.61 which is only 3.28x. Secondly we see that 8-threaded execution is now 6.90/1.61 = 4.29 times faster than single-threaded. What happened that multi-threaded performance is now better and it scales better? Simply – we loaded CPU with more work. That is general rule, the more work you place on the CPU, the more time is spent in parallel section and more gain you get from multi-threading. So, what would happen if you put CPU to some really heavy-work. It is surprisingly difficult to put i7 CPU into such a hard work that it sits busy doing calculations and not doing too much memory access. You would really need to use functions that do heaps on calculations on very small chunks of data sitting in L1 cache all the time or use some transcendental math functions that require FPU to spend way more than single cycle to derive result. Let us try with combination of raising to power, decimal logarithm and arcus sine. Now you can see that 8 threaded execution was (251.27/39.39) 6.38 times faster than single-threaded. So 4-thread performance was 251.27/64.63 = 3.89 faster than single-thread. And look at the “worker threads” time it is very close to single-thread time (250s vs 257s). This proves our point that except the effect of RAM and L3 congestion and slightly slower turbo boost speed, full-core threads scale perfectly as long as your formula puts them into some real work. Note: in all those tests we did NOT include the impact of disk speed because we run single-symbol individual optimization which runs out of RAM. Bottom line is: despite marketing hype buying 32 thread CPU does not buy you 32x performance. Real-world performance depends on many factors including formula complexity, whenever it is heavy on math or not, amount of data, RAM speed, on-chip cache sizes, turbo boost clocks differences between single-thread and multi-thread configurations and so on. The devil is in the details and there are no simple answers. I always say: do not assume. Assumptions are not facts. Unless you measure something you don’t know. Yahoo today changed the order of columns (swapped “Close” with “Adjusted Close”). To fix, you need to edit aqh.format file (in Formats subdirectory). A ready to use aqh.format file can be downloaded from here (right click and choose “Save target as…”). Place it into “Formats” subdirectory. You may have noticed over last few days that on some symbols (stocks and ETF that pay dividends) close price is below open, high, low prices. In the period May 17 – June 10, Yahoo was NOT adjusting for dividends so OHLC prices were adjusted for splits only. Charts looked correct (albeit without dividend adjustments). Then people sent complaints about missing dividend adjustments and Yahoo started adjusting for Dividends, but… only Close price, leaving High, Low, Open adjusted for Splits only. So here is where the mess is coming from. Yahoo is adjusting High, Low, Open fields for splits but at the same time they are adjusting Close field for splits and dividends. That is why you are getting Close field below OHL fields and strange looking charts. Another example – this time straight from Yahoo web site. Clearly visible Adjusted Close is lower than Adjusted Low, because they subtract dividends from Close price, but don’t do that for High, Low, Open prices. This needs to be fixed by Yahoo on their site. You need to complain to Yahoo to fix their mess. 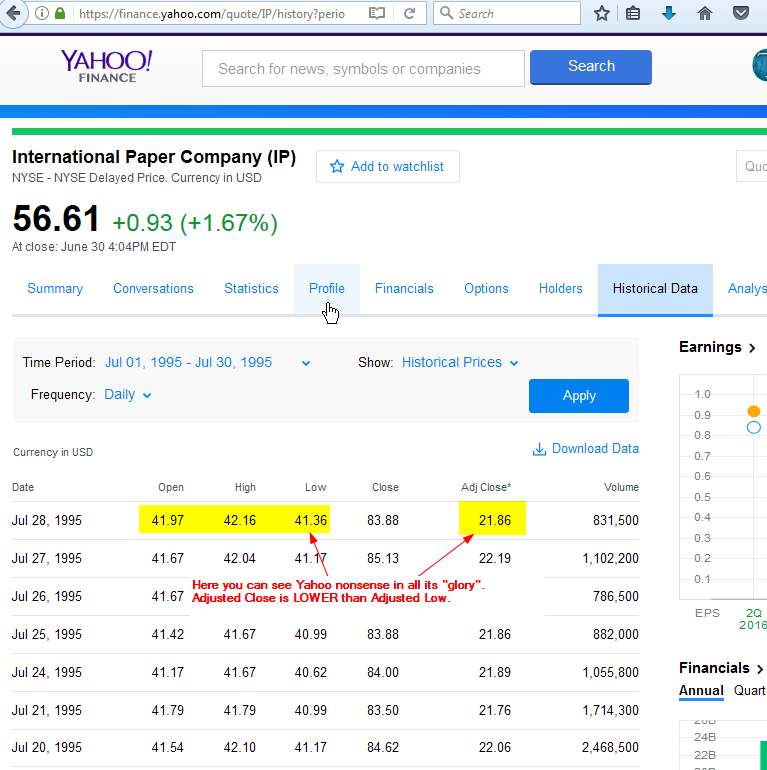 There is already a thread that describes this data error on Yahoo web site https://forums.yahoo.net/t5/Yahoo-Finance-help/Historical-Data-Split-and-Dividend-Adjustment-Errors-in-EEM/td-p/279800 but apparently Yahoo does not see / understand that yet. 1. Yahoo needs to adjust Open, High, Low fields the same way as they are adjusting Close. Where does AmiQuote save downloaded data? 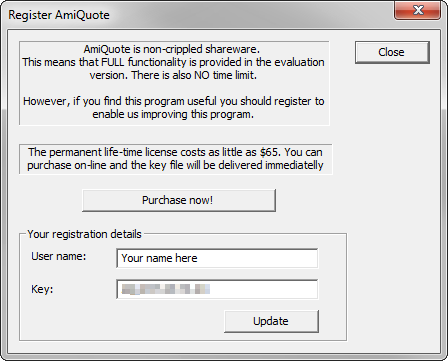 UPDATE: AmiQuote 3.21 public version is available now. 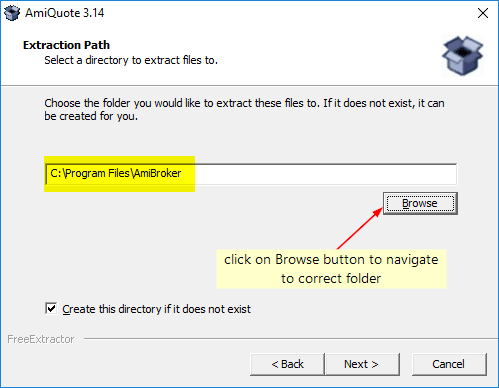 AmiQuote 3.21 is not a standalone installer, therefore – it requires AmiBroker installed on your computer and the installation path should point to the folder where AmiBroker is installed. Make sure to download correct version. If you have 32-bit AmiBroker, use 32-bit AmiQuote. 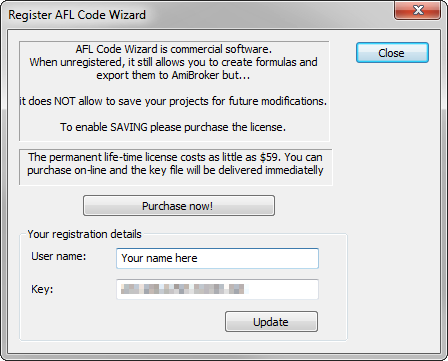 If you have 64-bit AmiBroker, use 64-bit AmiQuote. If you have both, install both. If you are getting “Failed to update registry, use REGEDIT” message, then you need to run AmiQuote just once with administrator rights – to do so click on AmiQuote icon with right mouse button and select “Run As Administrator”. Do this just once. Don’t run as admin all the time because automatic import won’t work. If it still does not work – you did something wrong. The program works fine, as long above steps are PRECISELY done. Rinse and repeat until it clicks. How to use your LiveCharts account with AmiQuote ? In May 2017 Yahoo Finance started making changes to their web services. During this time certain services may be interrupted or broken. 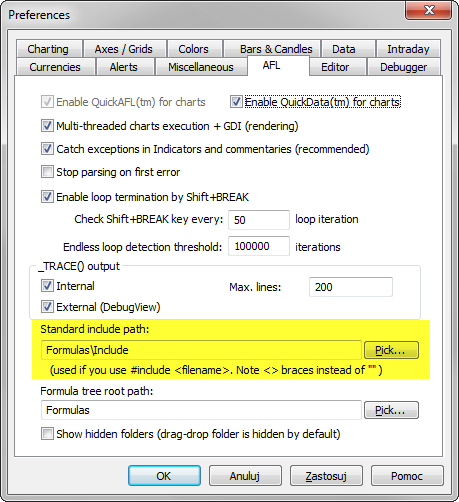 You need to update to the most recent AmiQuote version announced here http://www.amibroker.com/devlog/ and available in the download section http://www.amibroker.com/download.html to be able to use Yahoo data again. AmiBroker’s technical support staff everyday faces with very wide scope of subjects ranging from simple installation, lost registration details, password reminders questions to complex things like C++ programming or esoteric issues that occur say once a month or only when program is loaded with dozens of gigabytes of data. Support response times to those different inquiries obviously vary a lot. Technically we answer basic questions in 24 hours on week days (Monday-Friday). Very simple questions get answered even in minutes if you happen to ask them when our support staff is in the office (we are in GMT+1 timezone). If you are in different time zone, we may be currently sleeping so you may need to wait for next day. This response time applies to questions that are covered already in our Official Knowledge Base, Users’ Knowledge Base, Users’ Manual or internal documentation/resources. It is quite good idea to check those resources yourself as you are very likely to find the answer much quicker. For more complex questions that need some formulas to be written or checked/verified the response time may be higher (48 hours), as long as this check can be done by our regular support staff. Some complex issues/questions can not be solved/answered by support staff alone and then they are escalated to development. You need to keep in mind that development is 100% busy all the time, we are not sitting here doing nothing. It is all-day development job that is on-going and those complex support issues must wait in the queue. Also since some of issues/questions require lots of work (setting up environment to mimic customer’s setup, testing, single-step debugging sessions, going through millions of lines of code), it may easily take days or even weeks to complete. If development finds out that the issue is due to software problem, then the problem is either fixed at once or scheduled for fixing. This is a process. So please do not expect “next day response” for those kind of issues. You are also not going to get constant e-mails/updates like “we are working on it”, because we are always working on something in the queue. Please be patient, things are being worked on constantly. In order to register these programs, it is necessary to launch AmiQuote or AFL Wizard first. AmiQuote can be launched e.g. 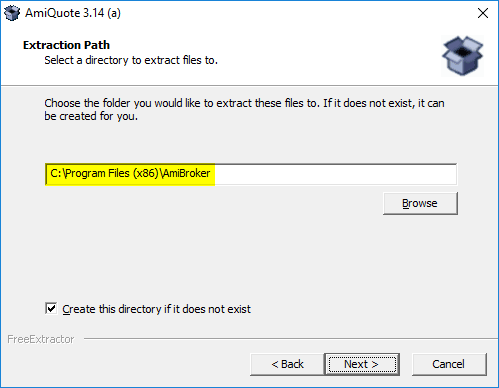 from the Windows Start menu or by double-clicking on Quote (Quote.exe) program in AmiBroker/AmiQuote folder. Then we can enter our name and the unlock code, then press Update button. After the program is launched it’s necessary to select Help->Registration details item from the menu. When we want to call such function in our formula, we should add function definition into our code, so AmiBroker could identify and interpret custom keyword properly. Consequently, if we use the function in multiple chart panes, each of the formulas should contain the function definition first. Since we may potentially define a large group of our own functions, pasting the definitions manually may not be very convenient. To avoid that, we can use #include statement and group our definitions in a separate AFL file which will be called with a single statement from our main code. Create a new formula. 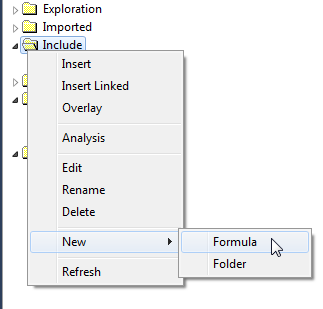 The preferred location is in Include folder in chart windows, we can in fact choose any custom location of the file. 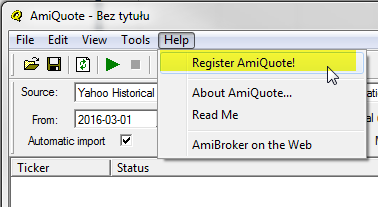 AmiQuote will import data to the database, which is opened in AmiBroker at the time of import. Additionally, if more than one instance of AmiBroker is opened at the same time with different databases loaded, then AQ will communicate with the instance that was launched first and will import data into the database opened in this instance of AmiBroker. Comments Off on Where does AmiQuote save downloaded data? When we subscribe to a real-time datasource, such as eSignal or IQFeed – our subscription package determines how many symbols we can access in realtime at the same time. The plugin configuration in File->Database Settings->Configure should match the subscription limit. 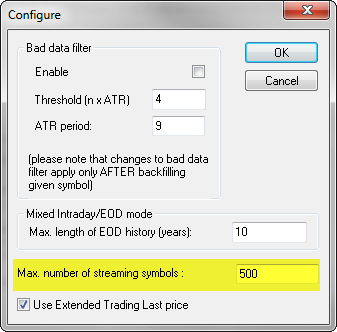 As it is explained in the users guide here: http://www.amibroker.com/guide/h_rtsource.html – although AmiBroker is able to handle more symbols in the database than the streaming limit, we should not really exceed the RT subscription limits in continuous screening during session hours. streaming and displaying RT data. Then such process will be repeated for each new symbol that is included in screening. As a result, that might cause various problems with the data source not able to handle that many backfill requests in a short time, additionally data-vendors may be pro-actively protecting their servers from abusing the streaming limits this way. Therefore – it is highly recommended to stay within the subscription limits for real-time operation and scanning to avoid problems.